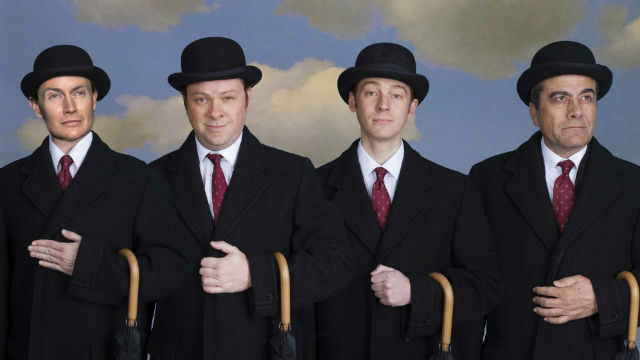 The actors in “Travels with My Aunt.” From left to right: David McBean, Richard Baird, Benjamin Cole and James Saba. What every uptight, passive, bourgeois milquetoast needs is an Auntie Mame or an Aunt Augusta to show him the finer points of the amoral, hedonistic life. Henry Pulling spent his first 50+ years in a safe, predictable existence, a banker who never ventured out of his London suburb. Then his mother died, and at the funeral, he meets his dynamic, assertive, irresistible septuagenarian Aunt Augusta, and before he knows what hit him, he’s traveling the world, roped into illegal and nefarious acts and hooked on adventure and high-risk capers. At last, he’s got a life — and having the time of his life. Celebrated and prolific English writer Graham Greene penned the novel “Travels with My Aunt” in 1969. Although he was known for his thrillers and works of espionage, he tried to put a little hip ‘60s sensibility into this one, with a pot-smoking American girl bound for Tibet. But except for that, and the spy and Nazi art-looting elements, it’s a veddy proper English affair, written in Greene’s eminently sober, literate, slyly humorous style. In 1989, British playwright and actor Giles Havergal adapted the book for the stage, and he did it in a very clever way. The script calls for four identically suited, bowler-hatted gents sharing all the narrations and portraying more than a dozen quirky characters from various countries, with diverse accents and dialects. It’s an actor’s dream, and the gifted quartet at North Coast Repertory Theatre seems to be having a ball. Director David Ellenstein has assembled a fantastic foursome: James Saba, Richard Baird, David McBean and Benjamin Cole. They alternate playing the tightly wound Henry, though only Saba plays the high- and free-spirited Augusta. But there are also English and Turkish cops, Italian priests, a Philadelphia CIA operative and a Russian wolfhound (Cole’s finest moment; he only has one line, and could be put to more and better use). Though some of the accents are more stable and believable than others, the ensemble is uniformly outstanding, gleefully changing character and nationality on a dime. Though Cole has the smallest part, his grunts and facial expressions are often priceless. You might think that this structure would wear out its welcome, but our interest is delightfully sustained by the lively writing, clever staging and wonderful acting. The set design (Marty Burnett) is simple and attractive: baby blue walls with circular openings that allow for effective locale-changing signs and projections, with niches that open and revolve as shelves and prop-presenters. The lighting (Matt Novotny), costumes (Elisa Benzoni) and sound (Melanie Chen) enhance the proceedings. Performances are Wednesday at 7 p.m., Thursday- Saturday at 8 p.m,. Sunday at 7 p.m., with matinees Saturday at 4 p.m. and Sunday at 2 p.m. There will a special talkback with the cast and director on Friday, April 21. Pat Launer is a long-time San Diego arts writer and an Emmy Award-winning theater critic. An archive of her previews and reviews can be found at patlauner.com.